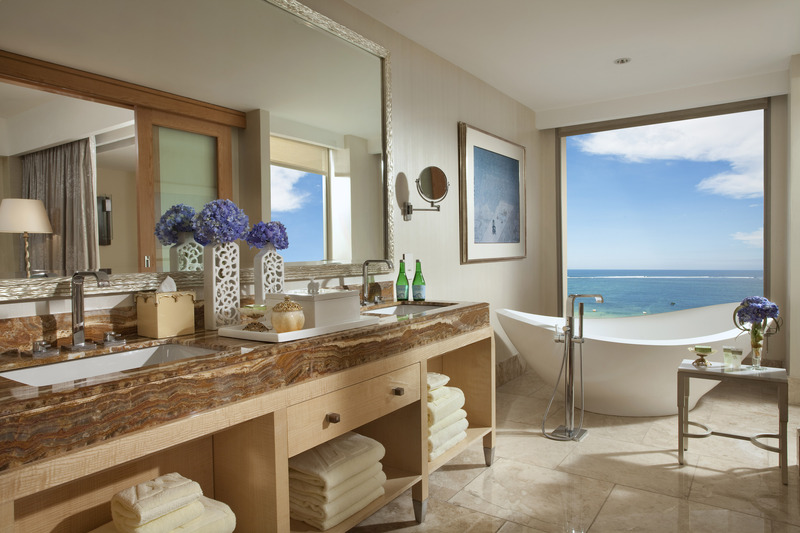 The Mulia, Mulia Resort and Mulia Villas offer luxury at every turn. Bali has been on my short list of must-visit destinations for many years. Located in Indonesia as part of the Coral Triangle (an area with a high biodiversity of marine species), Bali is the largest tourist destination in the country. I have no doubt that it’s the amazing beaches, dive sites (yes, I’m PADI certified) and the colorful arts scene that are calling my name. 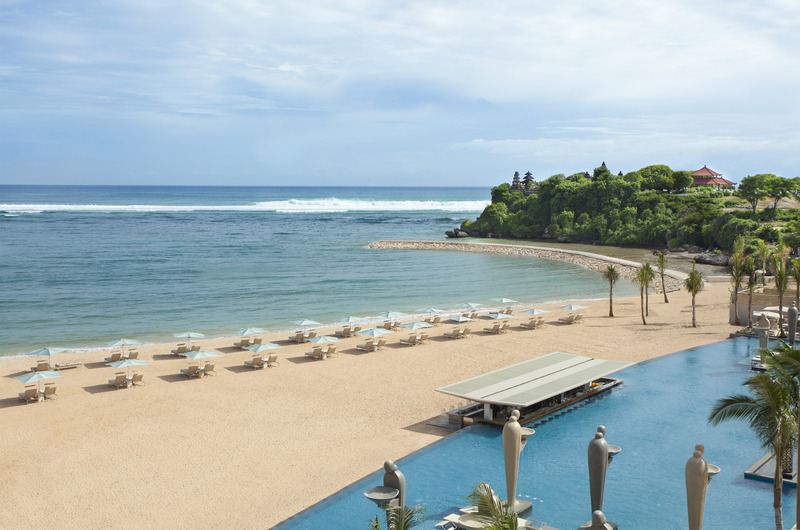 But, when I consider a stay at The Mulia, Mulia Resort & Villas—located beachfront on the pristine Nusa Dua beach—the idea becomes that much more enticing. 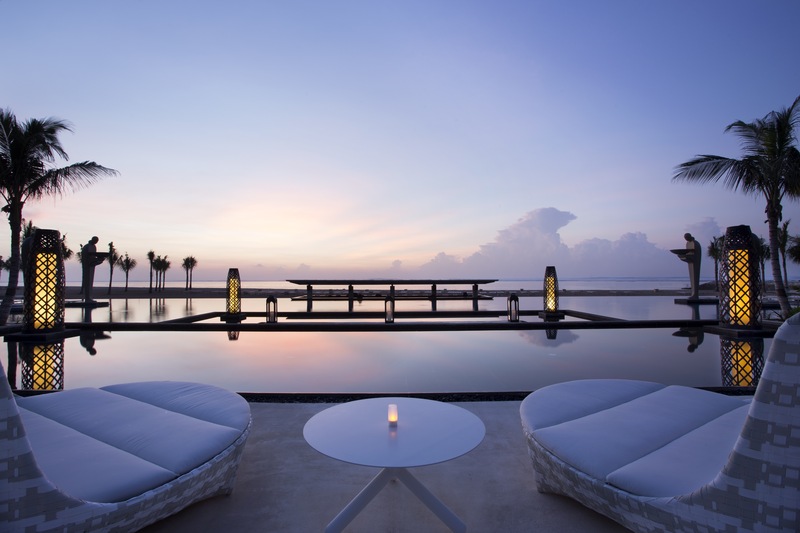 The Mulia, Mulia Resort & Villas, is home to three ultraluxe properties—all offering breathtaking views of the Indian Ocean. 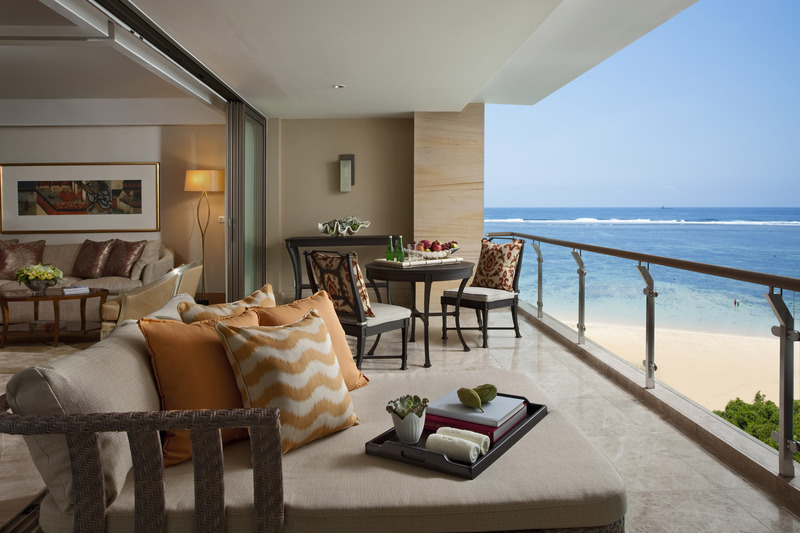 The Mulia (from $750 per night) features 111 private suites, each with individualized Butler Services and full-length balconies with a private Jacuzzi. Meanwhile, Mulia Resort (from $380 per night) features 526 spectacular rooms, suites, lagoon suites, dining opportunities and amenities, and Mulia Villas (from $980 per night) features 108 one- and two-bedroom villas (all the way up to the six-bedroom Mulia Mansion), plus top-notch services and amenities. All accommodations feature exquisite fine art, high-tech entertainment systems, 42-inch flat-screen TVs, iPod docking stations and jetted bathtubs with hydro-massage showerheads. 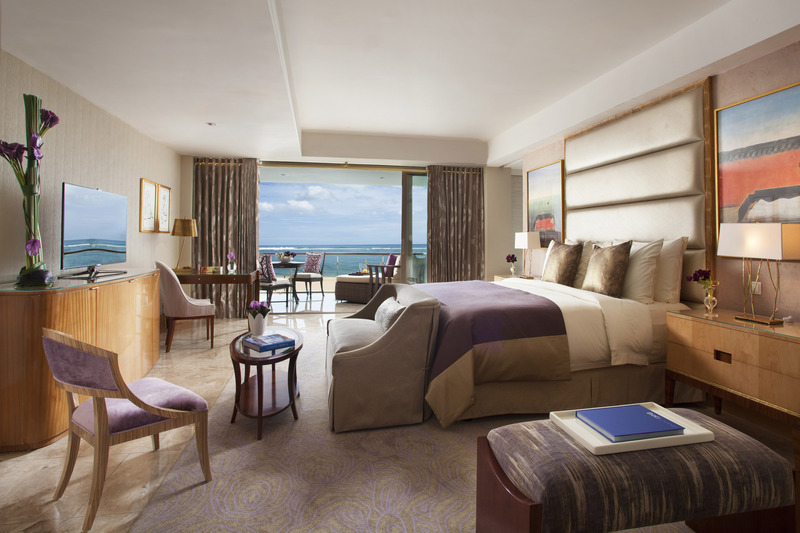 In addition to expansive and elegant suites, you’ll also find distinct lounges and oceanfront pools, with extravagance and opulence at every turn. A bevy of dining options also abound here, including the signature seaside Mediterranean and Pan Asian restaurant, Soleil (be sure to try the divine Sunday brunch); Japanese cuisine at Edogin; authentic Cantonese and Szechuan delicacies at Table8; special beverages and delicate desserts at The Bar; and afternoon tea or pre-dinner drinks at Sky Bar. Also be sure to check out ZJ’s Bar & Lounge—this hip sanctuary is the place to be for the fashionable crowd. Of course, some serious R&R is in order anytime you’re in Bali, and the tranquil oasis of Mulia Spa at Mulia Resort fits the bill with 20 treatment rooms, a state-of-the-art Wellness Suite, a Sweet Spa Finnish wood sauna, an Aroma Steam Room and an outdoor Meditation Area for yoga. Treatments include everything from deep-cleansing body scrubs to sea-salt exfoliations and mud wraps. The spa is also home to Asia Pacific’s only Ice Fountain Room—a room set at -1C that uses Chromatherapy Chakra cleansing colors, and hot- and cold-water pools, to stimulate circulation, boost metabolism, soothe aching joints and detox the immune system. After your treatment, spend some time at the Spa Beverage Bar, which offers locally grown fruit, juices and herbal infusions. The spa also recently launched a new lifestyle wellness program that combines fitness, sensible dining and a holistic approach to health. Choose from either the full-day experience (five to six hours) or the half-day experience (four hours)—each including a customized healthy dining menu, personalized fitness classes, signature spa treatments and access to the signature Wellness Suite (including the Ice Fountain Room). For those who want to work in a workout, there’s also a Fitness Center with a variety of cardio and weight training equipment, plus a daily schedule of exercise classes, including yoga, dance aerobics, boot camp, hi-lo impact training, aqua aerobics, circuit training, tennis, a total body workout class and more. Recreational opportunities are also plentiful here. On property, guests can choose from an array of swimming pools (family-friendly or private), personal training, biking, beach soccer and volleyball and more. Off property, the friendly concierge staff is happy to arrange for excursions, such as kayaking, touring the cliff-side Uluwatu Temple or visiting the Garuda Wisnu Kencana Cultural Park (offering breathtaking panoramic views of the island and one of Bali’s best Kecak dance performances). Bali is also home to various wildlife and animal parks, including the Bali Bird Park, the Bali Reptile Park, the Uluwatu Monkey Forest, the Ubud Monkey Forest, the Elephant Safari Park of Desa Taro and the Kebun Binatang Bali zoo.